(Nanowerk News) A new, relatively simple process makes it possible to create biocompatible particles called shape-controllable microgels that could be custom-designed for specific roles such as drug delivery vehicles, tissue engineering building blocks and biomedical research. The particles are made of two distinctly different materials: polymers called polyNIPAAm and sodium alginate, used in drug delivery. The two are combined to manufacture so-called Janus particles – named for the Roman god with two distinctly different faces. Like the Roman deity, the particles have two distinctly different sections, a design trait that makes them potentially useful for a host of medical and research applications, said Arezoo Ardekani, an assistant professor of mechanical engineering at Purdue University. A mixture of sodium alginate and polyNIPAAm is formed into uniform droplets using microfluidics, a technology for controlling minute micro-quantities of fluids with tiny tubes and channels. The droplets are injected into a "collecting solution" containing glycerol and barium acetate. Barium ions diffuse into the resulting droplets, causing them to "crosslink," or reinforce with chemical bonds, and jellify into squishy mushroom-shaped microgel particles. The particles can be induced to deform into different shapes by varying the concentration of glycerol in the collecting solution; microgels also can "phase separate," producing Janus particles. "The novelty of this work is that it is very simple to generate different shapes just by changing the concentration of glycerol," Ardekani said. 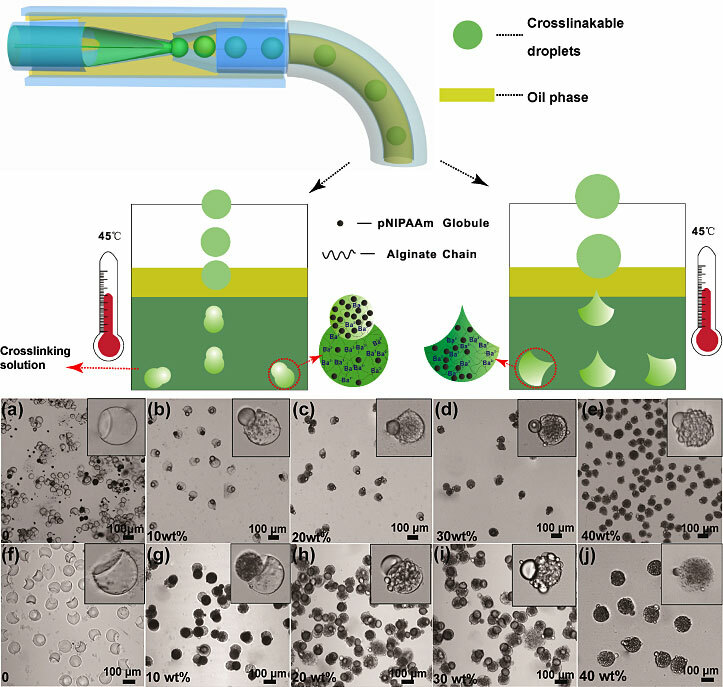 Findings are detailed in a research paper published in January in the journal Langmuir ("Fabrication of Shape Controllable Janus Alginate/pNIPAAm Microgels via Microfluidics Technique and Off-Chip Ionic Cross-Linking "). The paper was authored by Ardekani, her postdoctoral research associate Yuandu Hu, graduate student Shibo Wang and Harvard University postdoctoral research associate Alireza Abbaspourrad. Having the ability to control the shapes of particles could enable researchers to create a variety of drug-delivery vehicles, while Janus particles hold promise for a number of potential applications. For example, one part might be hydrophobic and the other hydrophilic, allowing them to be positioned and manipulated for tissue engineering or co-delivery of hydrophobic and hydrophilic drugs. Magnetic nanoparticles might be embedded into Janus particles during the fabrication process, making it possible to control them with magnetic fields as delivery vehicles and also for magnetically controlled optical switches. Cells also might be reversibly encapsulated into the microgels for tissue engineering purposes - the cells can be cultured within microgels and easily manipulated into different tissue structures, after which it is possible to dissolve the gels and release the cells; these gels also might be designed to respond to external stimuli such as temperature or pH.